November has been a busy time for our newsletters, with so many new models and figures coming into stock, Everything Dinosaur team members have been working hard to update subscribers on all the exciting developments. Take for example, the Beasts of the Mesozoic range. In the spring, this very popular series of “raptor” figures is going to be extended with the addition of another nine articulated replicas, including a limited edition Velociraptor osmolskae figure “Alpha”. Reserve lists for all these exciting new models have been opened, but as always, it is our newsletter subscribers and social media followers who get to hear about these developments first. New Beasts of the Mesozoic models scheduled for spring 2019. Look out for the limited edition Velociraptor osmolskae figure “Alpha”, an exclusive to Everything Dinosaur in Europe. The Beasts of the Mesozoic 1/6th scale “raptor” figures are stunning models and in the spring a number of new colour variants will be added to this popular range. There will be a new Saurornitholestes model (Saurornitholestes sullivani), in a striking purple and blue colour scheme. This model has been inspired by the famous “Road Runner” cartoon, the speedy Saurornitholestes is bound to get pulses racing. Furthermore, there will be two new Velociraptor mongoliensis figures, the frightening Velociraptor – black and a new, colourful V. mongoliensis figure, which will replace the original Velociraptor model that came out in the first batch of Beasts of the Mesozoic releases. There will also be a new Dromaeosaurus albertensis figure coming out in the spring, this too will be replacing the original Dromaeosaurus articulated model that was introduced in the first production run of the “raptor” series. Four new versions of dromaeosaurids being added to the Beasts of the Mesozoic model range in 2019. Breaking news for model collectors, in honour of the temporal and geographical range of these successful dinosaurs, new model sets will be introduced. New Beasts of the Mesozoic “raptors” for spring 2019. The newsletter features a further four new figures. There will be newly painted models in “Eastern” and “Western” model sets which reflect on the global distribution of these types of Theropod dinosaurs. 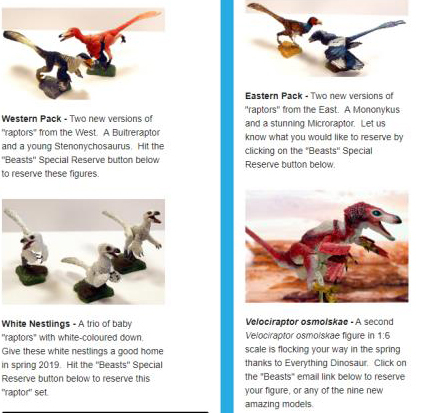 A trio of white hatchings will be launched, another addition to the highly collectable “nestlings” range and Everything Dinosaur will be stocking a second colour variant of an Asian Velociraptorinae subfamily member, the enigmatic Velociraptor osmolskae. Looks like our team members are going to have to prepare a special fact sheet to accompany sales of this figure. Our newsletter readers are amongst the first to learn about new replicas coming into stock. Subscribers can also be the first to join special VIP reserve lists to ensure that they can obtain new figures. The Everything Dinosaur newsletter is sent out periodically and it is free to join.